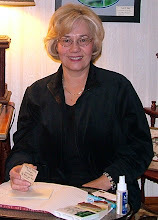 When I need several cards and I am short on time I use the a one Sheet Wonder Method. I love stamping but I also love cards that are quick and easy to make. The next time you need to make a lot of cards Try this technique. You can make a stack of cards in no time. For starters I just used one sheet of 8 1/2" x 11" piece of Whisper White card. First I stamped the leaves in Wild Wasabi (on some I stamped off first ) then I stamped the watercolor image set in Crushed Curry. Then over that image I stamped the sentiment in Blackberry Bliss, and finally filled it all in with Blackberry Bliss acorns. 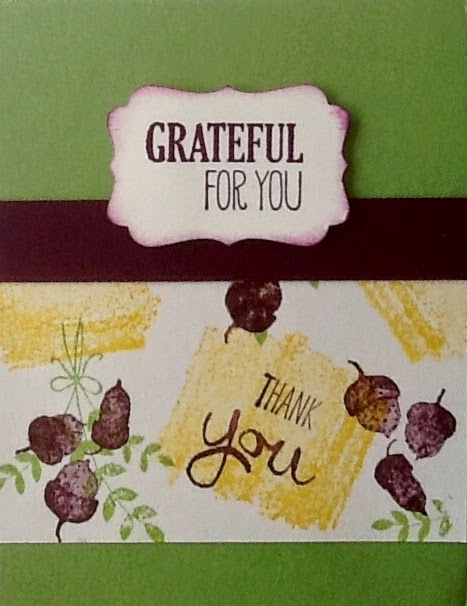 I used a 1/2″ X 4 1/4" wide strip of Blackberry Bliss card stock across the top of the stamped paper. Add your greeting, punch it out & pop up with the SU dimensionals and you’re done! I love making my own patterned paper, give it a try you will love it too. It is so much fun. Here are the measurements to make 8 of these cards out of the one sheet of stamped paper. Paper Sizes:Base card Wild Wasabi, 4 sheets, cut in half 4-1/4″ x 11″ score at 5 1/2"
Stamped Whisper White: cut 8 pieces 2-3/4″ x 4-1/4″ Cut the whisper white card stock in half at 4 1/4" and then cut those two strips into four 2-3/4″ pieces total of 8 pieces. Optional: if you want you can put a piece of white card stock inside each of the cards, if you do that you will need two more sheets of whisper card stock cut at 5 1/4" X 4"